The blue highlighted trail, Stairs/Escalator, is the trail of the week. The Stairs/Escalator trail combination in the Green Mountain Trails system in Pittsfield is a climber’s dream. 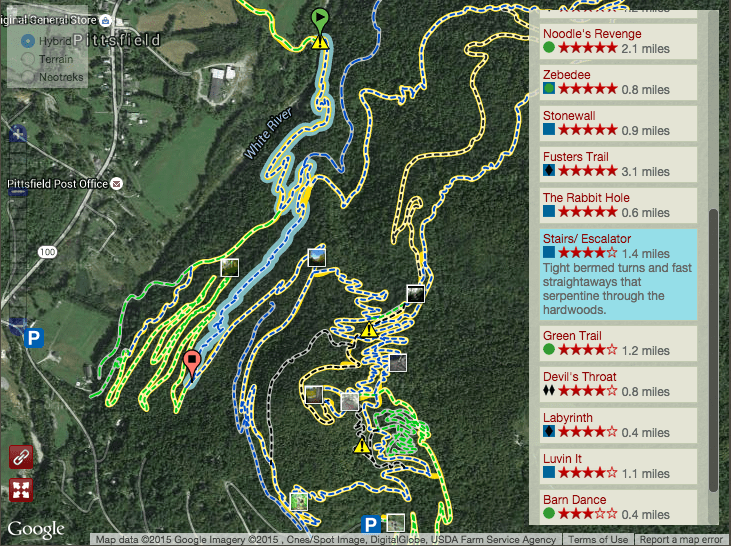 These trails gain approximately 400 feet of elevation over 1.4 miles, and have an average grade of 11 percent! The trails begin at the river crossing at Amee Farm on Route 100 in Pittsfield (at the end of the Barn Dance trail.) One begins by climbing sharply to the first bermed corner, which is followed by another short steep climb to the next bermed corner. This pattern of steep sharp climbs followed by bermed corners continues for most of the 1.4 miles. This is a great trail for interval training, and is a lot of fun descending as well as ascending. Notice the deep ravine caused by Tropical Storm Irene one must cross. Use this trail for interval training, and connect it to Upper Noodles and Luvin It for a fun climb to the top. Tony Accurso is the owner of Alpine Bike Works and Fat Bikes of Vermont located at 2046 Route 4 in Killington.